Here's a view of Sanborn Park Road, Forest Road 530, from a side road, FR 526, looking generally east. 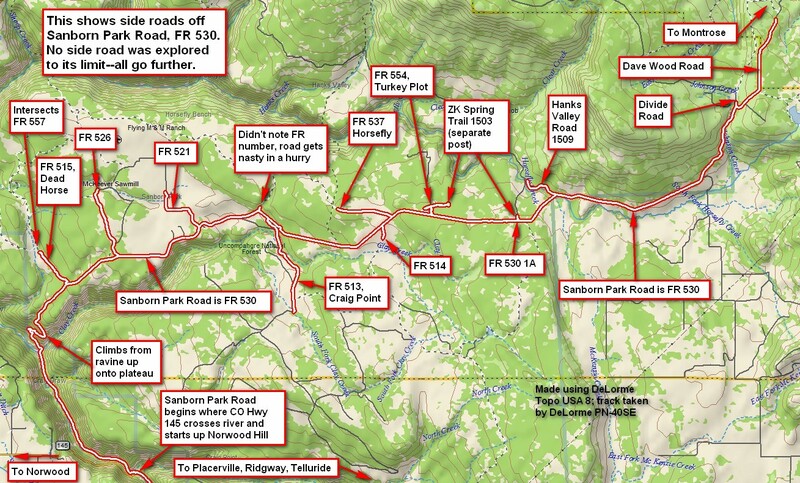 Here's the GPS track with the side roads identified. 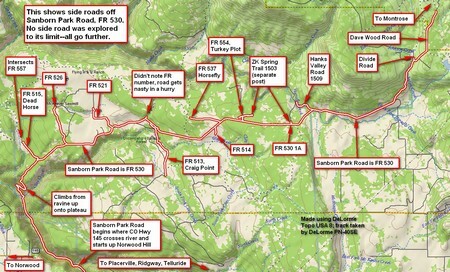 Click on image to see much bigger GPS track. Let’s walk through the GPS track from the southwestern corner. 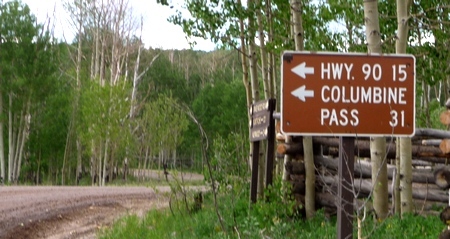 Travel west from Ridgway/Placerville/Telluride along Colorado Highway 145. The highway crosses the river and starts up Norwood Hill. Sanborn Park Road, Forest Road 530, begins where 145 crosses the river. It’s a well-graded road its entire length and can be traveled in a passenger sedan (not true of the side roads!). I opted for my trusty Yamaha XT-250 dirt bike. Make sure you've got gas! I had filled up in Ridgway. I wanted to top off in Placerville, but forgot there's no gas station there. 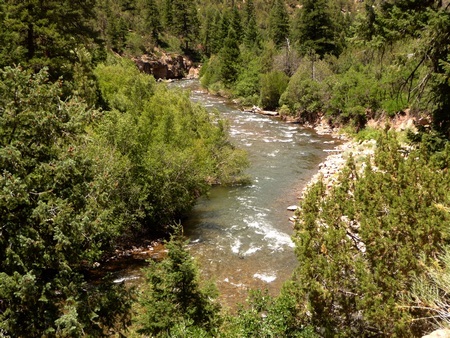 The road follows the San Miguel River downstream for awhile. Most of the land on either side of the road is private and there’s a fairly low speed limit. I never encountered a vehicle obeying the speed limit, but that doesn’t mean the sheriff doesn’t come along once in awhile. Sanborn Park Road follows the San Miguel River downstream for a bit. The road climbs up out of the ravine in a series of well-maintained switchbacks. Note that the road is graveled. Each little piece of gravel acts like a ball bearing, so use care. By and large I did most of the trip sitting down, but I often stood on the corners. Many of the side roads required standing to keep a steady line between the ruts. Once on top of the mesa, I started down every side road I could find. The first was Forest Road 515, Dead Horse, to the northwest. Here's the sign for FR 515, Dead Horse. Dead Horse Road, FR 515, is dirt and has some pretty deep ruts, which you’ll want to keep your wheels out of if possible. I followed the road down to where it intersects with FR 557. Both roads appear to go on for quite a ways, but do keep those ruts in mind. The picture shows the general nature of the road. A peek down FR 557, which intersects FR 515 and heads west. You can see the road quality here. It's dirt. Watch for ruts. This will become mud in the rain. Traveling east, the next side road is FR 526, taking off to the north. It’s much like FR 515—dirt with ruts. I will say that it has a nice entryway. I followed it for quite awhile until it started going down into a ravine; it got rocky and I turned around. Yes, it's as pretty as it looks. FR 526 starts out in the trees, but comes out in meadow quickly, with a good view of Sanborn Park Road to the east (see first photo in post). 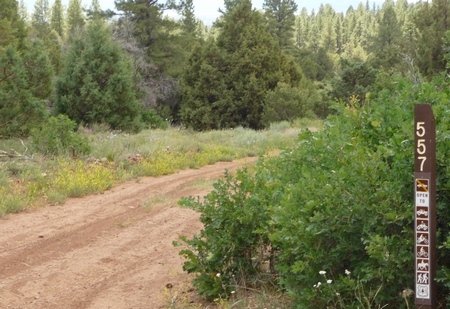 The next road, also to the north, is FR 521, which is a nicely-maintained road that leads straight to a ranch entrance. It then turns due west. I followed it around until I figured that going on wouldn’t show much change. Looks like a very good road to continue following, winding through ranch land. Any vehicle can travel the road as far as I went; beyond that I don’t know. I started up another road to the north. Unfortunately, I didn’t catch the number. The road starts out heavily rutted. After only a short distance, the surface turns from dirt to scree. I turned around. The next road, FR 513, Craig Point Road, takes off to the south. It’s well marked. 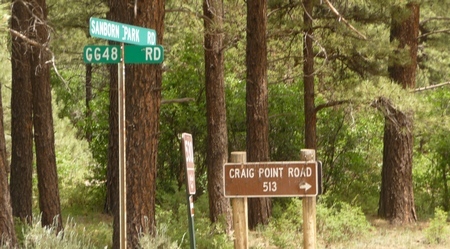 Here's the well-marked sign for Craig Point Road. Craig Point Road is more than well-maintained, it’s well graveled, at least for most of its distance. I followed it quite a ways because the views were great. But I also encountered cattle. I first came to a stop, then gently eased forward at about walking speed, always keeping an eye on Momma, because she’s keeping an eye on her little ones. Hey, share the road! Be wary of cattle anywhere in the area. Take your sweet time passing them. They're not the brightest creatures and will run directly in front of you rather than away from you. The next road, FR 514, North Creek, heads south. I followed it around a corner and found this stunning view before me. I took a panorama. Click on the image to see a much bigger version of the panorama. This is about a 90-degree panorama. The distant mountain at the very left is Mt. Sneffels. The mountain at the very right is Lone Cone. Toward the right you can see rain coming from a thundercloud. And, yes, that's a high-tension electrical line out there. Click on the image for a much larger view. Use your browser's 'Back' button to return. The next side road is to the west, FR 537, Horsefly, is fairly easy to traverse. Again, watch for ruts. The road after is FR 554, Turkey Plot. This road is very heavily rutted. I went down this road a bit and to my surprise encountered what looked like a single track trail, ZK Spring Trail 1503, clearly marked and permitting motorcycles. I followed it east. In two places tree skeletons have fallen across the road; these were easily circumvented. But after about 1800 feet, the road ended at a locked gate! I have a separate post regarding the trail. The next road, also to the north, is FR 530 1A. And interestingly, this is the eastern terminus of ZK Spring Trail, mysteriously blocked. See separate post. Next we come to Hanks Valley Road, a well-maintained road that winds around the geography and heads north. I’d love to follow this road to its conclusion someday. And that’s about it! Sanborn Park Road ends at the intersection with Divide Road. This point marks the eastern terminus of Sanborn Park Road. 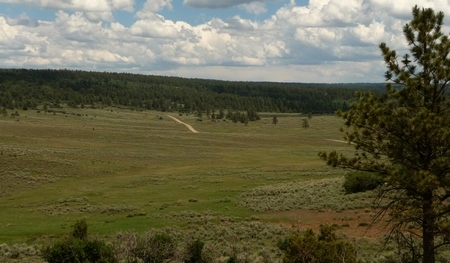 To the left is Divide Road, which ramps up onto Uncompahgre Plateau and in fact runs its entire length. The road forward is Dave Wood Road. See a separate post for the wildflower pictures. Jeff, it isn’t paved. Parts of it are graveled, making it okay in the rain, but parts are not. Definitely a route to take in high summer.